Sad news guys. We lost two more chickens the other day to raccoons. This time it was Funky and Dinah. Funky was a fixture at this house long before we even lived here. She was the Queen Bee and called the shots in the coop. We always thought Funky would outlive everyone. 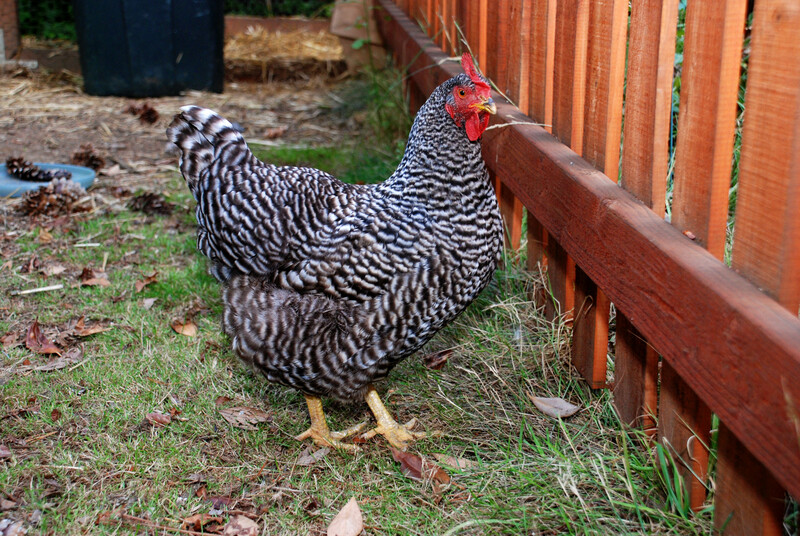 She was the one convinced Molly, our only surviving chicken, to jump the fence we built to keep them in the back of the yard and eat all our strawberries and peppers, which are bad for chickens. She was the loudmouth who would wake us up as early as 7 am with her squawking. We will surely miss her. And then there was Dinah. We adopted Dinah from some friends who were moving and couldn’t keep her. 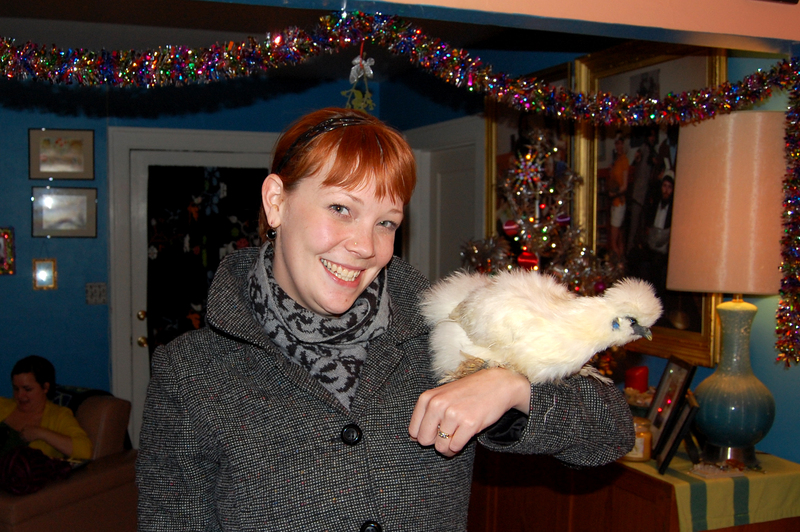 She was the same kind of chicken as our chicken Danger Bird, who we lost last year to raccoons. She was the biggest chick in the yard, and by far the best dressed. Dinah was at the bottom of the chain of command, since she was the newest to the bunch. Funky and Molly picked on her quite a bit. Dinah was the sweet shy one, always hiding in the bushes. She was the fluffiest chicken ever. Ever. Looking at her you would think that she was just fat, but it was all feathers. Fluffy, fluffy feathers. We’ll miss seeing her black and white spots grazing the yard. As soon as we found out that we had lost these two, one of my first thoughts was that Molly can’t be alone. 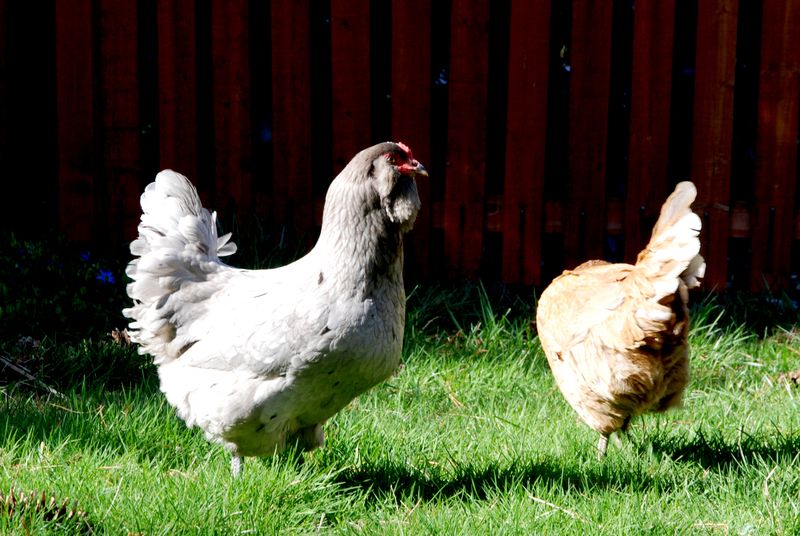 Chickens don’t do well on their own so we wanted to get her a new friend A.S.A.P. We went to the feed store where we buy their food and also where we bought Danger Bird and Lucy as chicks, and we also adopted Molly from there too. They didn’t have any chickens or chicks and recommended checking Craigslist. So I did. And I found a chicken that we’ve been wanting for a very long time. 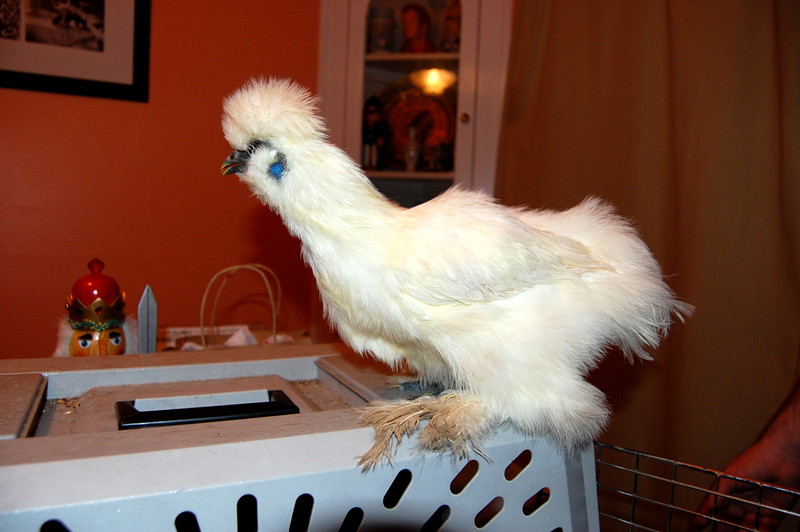 A Silkie Chicken. These are the neatest looking chickens! Every time we’ve seen one, we’re like “Oh my god! We HAVE to get one of those!”. So we got her. And her name is Phyllis. Phyllis Diller that is. She’s pretty much full grown. She’s tiny and adorable and lighter than air. We introduced her to Molly last night, and of course Molly had to let her know who was boss and peck her around a few times. It’s hard to watch, but they have to establish their pecking order. No pun intended. I checked on them this afternoon and they seemed to be getting along. Welcome to your new home Phyllis! Funky and Dinah, we’ll miss you dearly. Oh man! I’m so sorry to hear that Funky and Dinah are gone. Sorry that you had to go through that again. Phyllis is the perfect name for that bird! I can’t wait to meet her!